Approximately 64% of the land in the Niagara peninsula is agricultural, and about 21% is rural wooded or natural. The remaining 15% is considered urban (major centres being St. Catharines, Niagara Falls and Welland). Urban growth is expected to be greatest along the Welland Canal corridor, particularly in the southern portion of the peninsula. Source: Niagara Peninsula Source Protection Annual Progress Report, April 26, 2017. Grow the cluster. Grow the cluster by coordinating economic development, finding the voids, filling the gaps, and building on strengths in Niagara Region. Link food, farming and health. Work closely with a broad range of stakeholders to educate and inform consumers about healthy food products from Niagara Region. Foster innovation. Position the agriculture, food processing, food retail and food service sector in Niagara Region as “the place to do business”. Enable the cluster. Harmonize regulations and create an “open for business” government. Cultivate new approaches. Be a leader in developing programs to support food and farming. Source: Niagara Region Agri-Food Strategy, 2016. The Golden Horseshoe Food and Farming Alliance (GHFFA) is comprised of the Niagara Agricultural Policy and Action Committee, the Toronto and Region Conservation Authority, the Friends of the Greenbelt, the Ontario Ministry of Agriculture, Food and Rural Affairs, Vineland Research and Innovation Centre, Holland Marsh Growers’ Association, Durham College, Country Heritage Park, Ontario Federation of Agriculture, Ecosource, Food and Beverage Ontario, the Regions of Durham, Halton, Niagara, Peel, York and the Cities of Hamilton and Toronto, as well as local representatives from the food and farming value chain. In 2012, the GHFFA released the Golden Horseshoe Food and Farming Action Plan 2021, which identifies pathways for a more integrated and coordinated approach to food and farming viability in the area to ensure that the Golden Horseshoe retains, enhances and expands its role as a leading food and farming cluster. The 2012 Action Plan outlines opportunities for change to Grow the Cluster; Link Food, Farming and Health; Foster Innovation; Enable the Cluster; and Cultivate New Approaches. has produced an action plan entitled “The Golden Horseshoe Agriculture & Agri-Food Strategy”, which provides a plan for Ontario farmers in the golden horseshoe, which ranges from Niagara to Durham regions. Total farm area has declined since 2011, but the area dedicated to cropland rose 6.9% to 93.4 million acres in 2016. Overall farm numbers have declined, but the average area per farm increased from 779 acres in 2011 to an average of 820 acres in 2016. The total number of farm operators in Canada has declined from 293,925 to 271,935. The proportion of farm operators under 35 years of age increased since 2011. However, the fastest growing age group was farm operators aged 55 years and older. The average age increased from 54 in 2011 to 55 in 2016. Women make up a larger proportion of farm operators, from 27.4% in 2011 to 28.7% in 2016. 44.4% of all farm operators did some off-farm work, usually as a means of supplementing their total income. 12.7% of farms report that they sold directly to consumers. The profitability (expense-to-receipt ratio) is 0.83, which is largely unchanged since 2010. Source: Statistics Canada, Census of Agriculture. Paid agricultural work in the year prior to the census. 2016. Source: Statistics Canada, Census of Agriculture. Total number of farms and farm operators. 2016. Additional information from the 2016 Census of Agriculture is included in the Economic Prosperity Sector of this report. Greenhouse vegetable production: in 2016, the new Collaborative Greenhouse Technology Centre at VRIC opened, and received an investment of up to $5.76 million from FedDev Ontario to develop and commercialize innovative horticultural and greenhouse technologies, and bring an additional three automated systems to market. VRIC is working to develop the success of the Cold Snap Pear, which is exclusively grown and distributed in Canada. The Cold Snap variety is more resistant to disease and has a longer storage life than other varieties. Originally developed in Harrow, Ontario, VRIC was licensed in 2009 for the global rights for the Cold Snap variety. In 2011, VRIC entered into a commercial license agreement with the Vineland Growers Co-operative, providing the co-op with exclusive Canadian rights to produce and sell Cold Snap Pears. Trees have been planted across Canada and have begun to be planted in Europe and the United States. 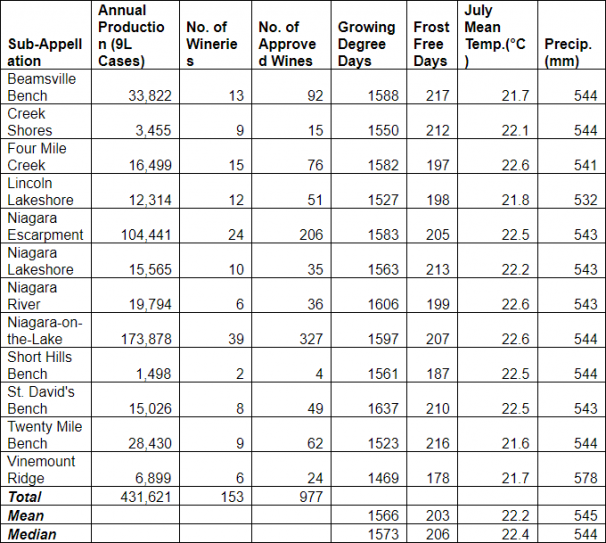 VQA (Vintners Quality Alliance) Ontario provides the information in the following table to show productivity of the Niagara Region appellation, by sub-appellation. An appellation is a geographical location where wine grapes are grown. 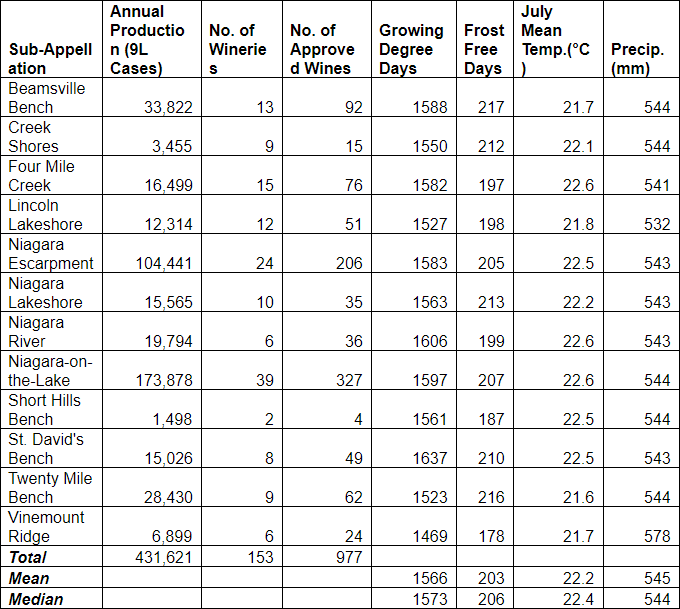 Source: VQA Ontario. (2016). VQA Resource Library. Niagara Region provides a directory of 10 farmer’s markets in Niagara, including location and hours of operation. In 2016, the Sustainable Farm and Food Initiative produced a report on behalf of the Ontario Farm Environmental Coalition, entitled “Food, Farm & Beyond: Our Commitment to Sustainability”. The report provides a 25-year review of Ontario’s Environmental Farm Plan program and Best Management Practices publications for Ontario agriculture. It outlines Ontario agriculture’s renewed commitment and plan for responsible sustainable farming for the next 25 years and beyond. The role of pollinators in a vibrant food system in Niagara is being identified. In 2016, Niagara College introduced a hands-on Commercial Beekeeping program to produce knowledgeable, highly skilled, experienced graduates. The Niagara Beeway focuses on restoring biodiversity and the honey bee’s role as an indicator of biodiversity. Food Systems in Niagara is a topic that represents the cycles and interconnections of growing, distributing, eating and recycling of food. People working in these areas are working together to describe how a healthy, secure, sustainable food landscape contributes to Niagara’s social, political and economic vitality. In 2015 and 2016, Niagara Connects engaged over 100 people in the Food Systems conversation. These individuals work in: growing, preparation, consumption, access, processing, marketing, distribution, agritourism, education, nutrition, health, research, business, economic development, employment, waste/disposal, environmental sustainability, policy and government. Eight (8) Food Systems in Niagara Building Blocks were gathered and reviewed. These include a 2015 network map that illustrates connections and lines of communication among 210 people from 143 organizations in the food continuum in Niagara and beyond. Eleven (11) inter-connected food systems categories were identified: Agriculture; Land Use Planning; Local Food; Economic Development; Food Distribution; Retail and Food Outlets; Food Security and Poverty Reduction; Health; Child and School; Education and Research; Garden and Food Skills. A Food Systems in Niagara Map was created, to show the inter-connected, complex web of assets that make up our food system. Six (6) Suggested Action Steps to advance this work for Niagara were identified in the report Strengthening Our Food Assets to Boost Niagara’s Vitality: Call to Action to Build a Food Systems Network for Niagara , published in December, 2016. Take a Collective Impact approach to diverse food systems players sharing relevant, reliable data as a means to understand internal and external factors affecting Niagara’s food continuum, and make connections that spark innovations. Convene a Reference Group of leaders that looks at local, provincial, national and international food systems, to identify components, interplay and contributing factors that benefit Niagara. Better understand where food systems work in Niagara fits into, and can benefit from broader related work in the Golden Horseshoe, Ontario, Canada and beyond. Explore food literacy and how it relates to Niagara health outcomes and personal and community economic prosperity. Examine how food literacy (and food skills) relate to people’s broader levels of literacy, living conditions, life experiences, and access to food and facilities. Gain an understanding of vulnerabilities of Niagara’s food systems to climate impacts such as quality, quantity, accessibility and governance of water; and extreme weather conditions and events. Explore food as a powerful force to draw people together to build up their capacity to experience security and prosperity. Relate this to the broader work of the #Rethink Niagara systems approach to investing in the people of Niagara. Between 2008 and 2016, of the 318 neighbourhood-based projects contracted out to 83 different agencies by Niagara Region’s Niagara Prosperity Initiative (NPI), $673,112.91, or 5.6% of funds invested supported 22 Community Garden projects across the region. The Niagara West Community Garden Collective was formed in 2015 in a cooperative effort between the Employment Help Centre and the Niagara West Adult Learning Centre. Gardening knowledge and support are provided through free learning seminars and food handling skills through workshops about canning and cooking. The Collective has 50 garden plots in three locations across Niagara West. Municipalities are expected to review and update their official plans to conform with the updated plans. Upper- and single-tier municipalities’ conformity work is to be completed by 2022. The Niagara Parks Commission (NPC) is a self-funded agency of the provincial government. NPC is responsible for the maintenance of 1,325 hectares of parkland, stretching 56 kilometres along the Niagara River from Lake Erie to Lake Ontario. NPC’s mission is the same today as when it was first established in 1885: To preserve and enhance the natural beauty of the Falls and the Niagara River corridor for the enjoyment of visitors while maintaining financial self-sufficiency. In 2017, the Commission highlighted its 132-year history through an investment of $563,000 of Ontario 150 Funding Program support. The funds supported 5 legacy projects with a “Rooted” theme (rooted in legacy, nature, life, the garden, and design). The Bruce Trail Conservancy (BTC) is a charitable organization committed to establishing a conservation corridor containing a public footpath along the Niagara Escarpment, in order to protect its natural ecosystems and to promote environmentally responsible public access to this UNESCO World Biosphere Reserve. Within the Niagara region, the Conservancy maintains 88.8 km of main trail, 38.5km of side trail, and 23 properties totaling 166 acres. In 2017, the City of Niagara Falls opened the Canada 150 Pathway, the sixth section of the Millennium Trail, first established in the year 2000. The trail uses the Ontario Power Generation hydro canal corridor which runs north-south through the city. In 2015, the Niagara Falls Lions Legacy Trail section was constructed, from Thorold Stone Road to Whirlpool Road. The vision is to have the Millennium Recreational Trail sections connected to enable residents to travel the length of the city and connect to the Niagara River Recreational Trail, without having to access any roadways other than a short distance along Whirlpool Road. The Canada 150 Pathway project was supported by the city allocating $615,000 of the Ontario Lottery and Gaming Corporation (OLG) hosting fees paid to the city for hosting the Niagara Casinos. The above information can also be found in the Recreation and Sport Sector of this report.